Score! I found the chair that I wanted, marked down to 50% off! Why, you may wonder? What’s wrong with it? Oh, nothing. Just a 2″ tear smack in the middle of the fabric where your head rests. See it? It’s up near the top on a blue part of the fabric. Do you think it can be fixed? Right now, I can still return it. Then I can either go for the full price (non-torn) chair, or skip it and keep the orange chair instead of selling it. It looks like my options for repair are to patch it, or to darn the upholstery with a looped stitch. The chair came with matching armrest covers that I could use for a patch. I could probably take it somewhere to be repaired too, but if I’m going to put more money toward the chair, I may as well buy a new one. Think it could be saved? I say yes! That looks like it could easily be sewn up and who would ever notice? If anything its more impressive that you salvaged something to get a sweet deal! I agree! Looks like you could fix it and it would hardly be noticeable. It’s busy enough, I think! I LOVE IT! ouch! I would suggest looking for fabric to add underneath it. hopefully matching but I know that may be hard to find. maybe you can grab some from the back of the chair where its less notice able. patchwork it. how much was it? How about an applique of the entire flower cut out of the armrest fabric? You could cut an identical flower out of the armrest fabric and cover the tear. If you have done any sewing, you could do this yourself easily. I say darn it if it isn’t a chair that will get much use. Otherwise, look into getting it professionally repaired since darning isn’t the most long term/long wear repair job. Wait. I didn’t realize that it’s $800 at 50% off. That seems expensive, and I think I saw that same (or similar) fabric available for sale somewhere. Or maybe it was as a dress or curtains? I don’t know about keeping it, Nicole. I would negotiate more off the price. Love Debbie’s idea! Also you could toss a throw over the whole back side as another fix. As the parent of 3 kids nothing being “too precious” is key. Teens are harder on things than toddlers if you can imagine! You said it all right there! You have kids and pets. Soemthing is bond to happen. Good thing is the fabric is busier, so it can hide lots. I say stitch it! If the fix is noticable, why not add a cute throw over the back? I think the interfacing sounds like a great idea! Put some fusible behind it, stitch it closed and then iron it, it will add some strength so it won’t pop open again. Oh how I love that Anthro chair! I love anything Anthro. That’s a pretty hard deal to pass up….I think I’d look into the mending option! But seriously, it’s a great find at a great price. Return it & keep the orange chair. A chair in need in reupholstering should be more of a discount than 50% off imo (given the cost of reupholstering) and chances are good that any patch or repair isn’t going to look great or be prone to re-ripping. To be perfectly honest, I also like the pattern of the orange chair better. However, if this chair is something you really love, I’d spend the money to get one that isn’t damaged. It’s TOTALLY save-able. :) it wouldn’t take much to make it a decorative repair. I’m thinking a patch cut out in the shape of one of the flowers and decoratively stitched on top. There are lots of expensive chairs online that are decorated like that! :) Can’t wait to see what you do. It’s SO SO cute. I would definitely keep the chair, and just sew it up. Way to go on a great deal! Ohhh, I love it! Jealous! What a great find. I vote keep it and repair it :) The pattern is busy so I don’t think anyone will notice a bit of stitching, or even clever patchwork. Perhaps you could get a nice throw to disguise the repair/protect the vulnerable area from further wear and tear? call bush upholstery (just down the street on roosevelt). They’ll come to your house and tell you how they would repair it and how much it would be. Then at least you’ll have an expert opinion. I totally think you can salvage it. I would keep it! I honestly couldn’t find the tear in the first picture. Darn the hole and put a throw over it. That’s my vote. And if you are selling the orange chair, I’m interested — and local! I would repair and see if you can make a headrest cover out of the arm covers using Debbie’s idea. I say repair it. I was thinking the same thing as some of the comments before me, maybe cut a flower out and stitch it on with a bright color so that it looks intentional, or maybe a few of them scattered around. I would simply throw one of the armrest covers over the top of it! With an original price of nearly $1600, I think this chair was overpriced from the beginning. I think it should’ve been marked down more than 50%. I’ve seen Anthro’s furniture marked down more than that when there’s no damage at all. Personally, I would return it. It may eventually end up on sale anyway. I say return it. That is still a lot of moolah for something that is “broken”. Even if you “fix” this it will be noticeable, and it will be prone to re-rip in that same spot as the fabric will be weaker from any fix. As you said, the other chair is in great shape– keep it around! Better to be like Goldilocks and hold out for the one that is “juuuust right”. Fix it. We have a leather chair that had a tear in almost the same place. We had it professionally fixed (since it was leather and Stickley and my husband darn near had a stroke when it ripped) and you can’t tell where it was ripped. Even a professional leather repair wasn’t that expensive. If you wanted to attempt it yourself I wonder if you’d be able to slip an iron-on patch underneath the tear so that you’d be bonding the rip closed. My first thought was to cut out a flower or two from the armrest covers and fuse it with an iron and interfacing, then stitch around the edge in a contrasting thread (or not). It would only add to the unexpected, quirky, anthropolgie aesthetic. Good luck! i agree that even at %50 off that is a lot for something that is damaged. if you do repair it, you have to take care to make sure you are doing iin a way that will prevent it from running from stress on the fabric. Please please never get rid of that other chair!!! Try fusible interfacing or something like StitchWitch or Heat and Bond (single-sided). Carefully cut out a piece a bit longer and wider than the tear and work it into place. You may need to pin it in place. Take a damp press cloth and your iron (Check the heat by testing your armrest covers to find the appropriate heat level) and carefully iron the area. Fusible fabic is very forgiving and if done propertly will hold up very well. Ah! Keep it! Stitch it, patch it, cover it, whatever! Just keep it! Love that chair. Even at 50% that is a pricey (damaged) chair… HOWEVER with that being said, if you love it I would keep it. 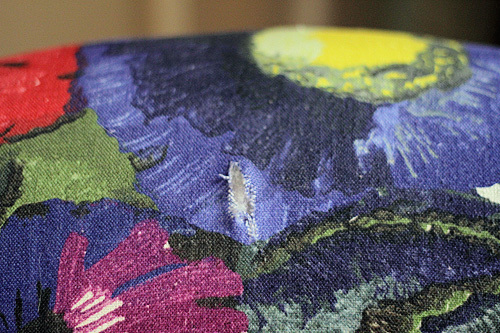 Here is what I would do – take the armrest cover, (perfectly) cut a flower out… a whole flower. Then adhere the entire flower where the hole is. This way, it will completely blend in with the pattern and from a distance just look like the flower is part of the pattern. You’ll only be able to tell from where it’s a bit raised. If you really want it to look intentional, then cut out 5 or 6 other flowers and add it all over the chair. Once they are glued on, you could do a little stich around each of the flowers so it looks like it’s a “patchwork” chair… very anthro-like. Dude. No. I don’t care if it was 50% off, $800 is a ridiculous amount of money for something that is BROKEN. There is no way that I could ever call something damaged that costs that much money a “bargain” while taking myself seriously. I can see its not the popular decision….but even at 50% that is a lot of money for something you have to invest more time and maybe money into. For $800 is there another chair that you would like just as much? I think a patch would work if it does not call too much attention. If you love it, $400 is not that much really. $800 is the 50% off price. Do you embroider at all? I would totally embroider some sort of cool design there and make the repair actually a sweet addition to the chair. My son ripped his duvet and when i stitched it shut, I turned the repair into his name. He loves it. Of course, I don’t think I’d be embroidering words on it, but maybe some sort of sweet organic scroll-y design that reinforces the pattern on the fabric? or maybe an E or an A or even something like a strawberry or some sort of token that means something to you? It could be really great. i agree with bryn to use cut-outs! i think it will make it look more ‘artsy’ + unique. maybe patch the small tear with a matching big, purple flower + a few smaller yellow ones, then balance it out by placing a few more flowers strategically. i once did when i was working on a lace dress + i accidently made a small tear in it + i ended up liking it better. if you love the chair, i say work with it! repair it! 50% off is a great deal! you can go “granny chic” and applique a massive doily as a head rest cover over top! it can TOTALLY be saved. Return it, so I can buy it. Seriously, fix it. Personally I’d get some coordinating embroidery floss. Fix the tear with the darning stitch, do a little embellishment around it, then embellish the chair in a few other places. I love the look of hand embroidered embellishment on pre-printed fabric. I agree with everyone who said this is still way too much for what it is. The fabric is obviously not very durable and not really upholstery weight. The quality just isn’t there for the price. The regular price of this chair completely blows my mind (and it still blows my mind at half off!) I’d go for a vintage chair and then reupholster that in a fabric you like. It’d be much less expensive and likely much higher quality. Ok I have a bit of an off the wall thought that could be too difficult, but what if you were to embroider a couple random flowers on the chair and somehow work in the tear into the embroidery (aka stich it up and work it in). I agree — $1600 is a ridiculous price in the first place, and it’s more ridiculous to pay $800 for something that is damaged. Shabby-chic is only fun if it’s also cheap. And if you don’t want things that are too precious b/c of the kids, then steer clear of $800+ chairs altogether. I looked at a lot of floor models trying to buy an Astrid chair a few years back. I thought the prices for worn or damaged chairs were ridiculous. If you love this chair, buy a new one or, better, wait until it goes on sale, which will inevitably happen. Return it. It is damaged and prone to more damage and is this a sign that the fabric in general is easily damaged. I have kids and dogs and now I try to be very selective about any upholstery. This fabric doesn’t look like it’s going to do well in the long run. And if you’re anything like me, the fact that you had to ask is your own way of knowing what you think you should do too! If you had to ask, you don’t love this chair. I’d return it. I’ve always loved the orange Anthro chair. It’s seems much more of classic. The new chair will be pretty hard to mask the repair. $800! yikes. It would probably be an easy fix. However, I’d return it since I personally would not want to spend that much, even discounted, on something not perfect. I would keep the old chair and chose a fabric you like for to reupholster it with. I totally think it can be saved, it’s a beautiful chair! good luck! As cute as that chair is, I do think that it’s a crazy price, even at 50% off. I have recently learnt to do traditional upholstery and I know that the overall quality of your latest acquisition will be poor compared with the work of an upholsterer. My worry with repairing the tear is that it will just rip again in time. 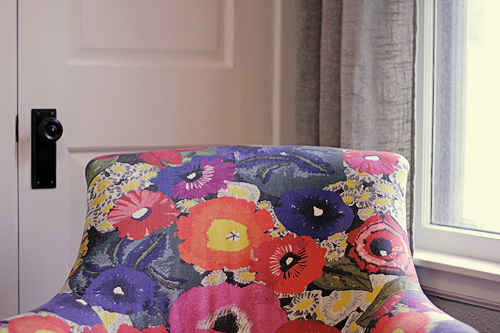 Choose a gorgeous fabric and make-over your orange chair! Agree, 100%. Maybe you could find a print very similar (I’m sure there’s got to be something out there that you love just as much or more!) and take your orange chair to get professionally upholstered? I just think $800 is a tad much for a damaged chair. Personally I love your orange chair better which is saying a lot because I abhor the color orange! The shape is gorgeous and if you are truly tired of the print I’d have a slipcover made in a fabulous floral like the ripped chair. I don’t know if I’m just at that time of my life where I’m tired of fixing stuff, kids grown up and rather have what I want but I wouldn’t keep that chair. IMHO it should have been marked down less than half, but even it was, I still wouldn’t keep it! PS I assume someone cut the chair while unwrapping it? Otherwise, ODD that it would rip in that spot. It may be a print but probably wouldn’t stand up to two little ones if that’s the case. I like the orange chair better. JEALOUS! It’s super cute, and the tear is super tiny. You could just put a throw blanket over it to hide the tear, lolololololol. Any chair at $800.00 should be unused and perfect. I agree that any chair at 800 should be in perfect condition. I vote to keep the orange chair mostly because I love it! Orange chair gets my vote without a doubt. Reupholster it if you are in need of a change. In the spirit of reuse recycle I would tuck a little square of fusible interlining in the hole and press. You would hardly see it at all, and it’s not a high traffic bit like the seat would be. If that chair, at 50% off, was still $800 I would say return it and recover your orange chair in that same fabric and still save money. It is not a stain that would be hidden due to the pattern, it is a tear that will only get worse over time. You should have received it for aboutg 80% off so shame on the store that sold it to you. I love it – maybe you could use the armchair covers to make a slip to go over the headrest of the chair? OR just pick a block colour that matches and do it? I think that would look great. But I would fuse and patch it first so it doesn’t tear further. Hm. The tear is almost on center. What about doing something really fun, like a monogram patch? Perhaps something like, this, on a blue background? Because what would be cooler than an personalized chair? Agree with the rest of them – that chair is SERIOUSLY over-priced!! And with the tear in it – they really should have marked it Waaaaaaaaay down! Half off is no bargain. I think you can have a beautifully furnished home on a budget. I personally prefer to stick with solid colored pieces (chairs, couch) and then change up the pillows and other items in the room. Easier and much less expensive when I want to change things! Well, as a cat owner and new mom I’m thinking that you might go buy the new one and get a tear in it the next day! I think with the pattern and a creative repair you’ll love it just as much. I say keep it!! You might want to ask Amanda at Spruce (http://spruceaustin.com/contact/) and see if it’s self-fixable before taking it back. She might have a good idea to save it! Wow! tough call. After reading all the comments and loving this chair just as you do, I vote to return it. I think that having things in your home that make you smile when you look at it is worth a million bucks. With that said, tears grow. Even if mended it will be a weak spot and that is an area that will be worn being a head rest. So, will this chair still make you happy next year if the 2″ inch tear becomes a 10″ one or you have to put a cute throw over the mended area because it may not look right. If you are OK with the worse case, keep it and love it! Hey Nicole…been reading your blog for a while…LOVE it :). If it were me, I would return the chair and recover the orange chair instead…it would be cheaper than $800 for a torn chair. I’d say keep it … you seem to really like the chair. It’s totally fixable. I’ve had a ton of luck with the combo patch/ darn method (it helps reinforce the seam / but the patch is hiddon). It’s simple – slide a piece of fabric that matches under the tear and sew the tear together (while sewing through the fabric below at the same time). I’ve used it on everything from upholstery, clothing to even professionally repairing a grand drape in a theater. Good luck! Again – if you love it, keep it. You’ll be glade when the first toddler with yogurt stains it and you didn’t pay full price. Not diggin the chair or the pattern. I prefer the orange one. Love orange. 2. cut the piece in a round 2x larger than your rip and tuck it behind your rip. 3. have your husband help you match the ripped edges together while you lightly iron the two pieces together. 4. Let the patch cool. 7. if all else fails, use the arm covers to make a headrest cover. 8. check the fabric with the arm rest to see how it irons before taking an iron to the chair. This only works on linen/cotton fabrics. This method is great if you don’t want to darn the fabric & if you don’t want a patch on top. This chair has so much less charm than the orange one. Keep the orange! It looks so nice with your living room. Although maybe a shot of the whole room with this chair in it might change my mind. Still, not knowing how the room looks as a whole, keep the orange! Sorry, but my vote is return the chair. You will always note the tear, even if it’s repaired, and may regret the (huge) purchase. The only way I would spend that much for a chair, any chair, is if it is in perfect condition. They should have marked it down MUCH further! That chair is way too overpriced for something that is damaged in such an obvious way. I don’t think you could have a tear in a more visible spot. a tad too pricey for me! Still what about bright zigzag contrasted sitching? Maybe not the look you were going for but at least it doesn’t pretend to hide it! I love, love, love your orange chair!!!! I say keep what you have! I think I saw the chair at Anthro. I agree with some of the other comments, at $800. it should be perfect. $800 is not cheap. Any chance they might further reduce it? If you do keep it, I’m sure it can be repaired. The pattern will hide the stiching. 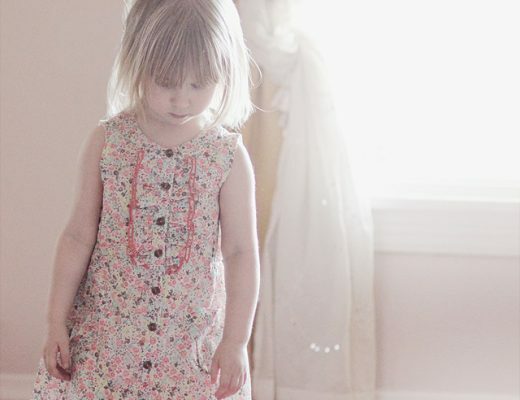 Find a giant fabric button and sew it there. It would look like it was meant to be there. I’m 100% for KEEPING the orange chair. I think it can be fixed easily (I’ve done this before), but for $800 you might be able to have your old chair re-vamped and fall in love with it again. I did the loop stitch fix on a few chairs. The orange chair is sooo much nicer…I vote keep the orange chair, take the ripped one back. Sweet! Now you can take it off your Wishlist! FYI: Those spectator pumps you linked to are on sale for only $34! P.S.-remember to take chair off your Wish List!